Raggedy Ann, a symbol of wholesomeness and simpler times, joined flashy Barbie as a National Toy Hall of Fame inductee on Wednesday - thanks in part to a letter-writing campaign by legions of fans. The cloth doll with reddish yarn hair had been rejected four times by the selection panel. But both Ann and the Jigsaw Puzzle made the cut this year, elbowing out more than 90 contenders including G.I. Joe. Other inductees include Mr. Potato Head, the Hula Hoop, the Slinky and Silly Putty. Many of Ann's supporters consider the 87-year-old doll superior to Barbie and were miffed Ann had been passed over. "Barbie represents an idealized image of beauty. Raggedy Ann represents a huggable, lovable friend," said Patricia Hall, a San Diego author who has written books about the Raggedy Ann phenomenon. The hall received hundreds of letters supporting Ann's induction from as far away as Japan. One was from an elderly man who said he took Raggedy Ann with him on air missions during World War II. Johnny Gruelle created Raggedy Ann in 1915 to entertain his sick daughter. 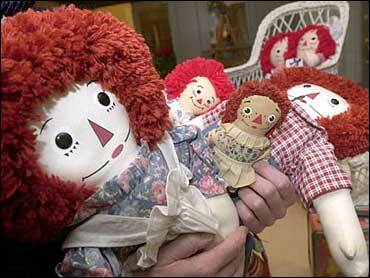 Raggedy Andy, the doll's brother, was born in 1920. "After Sept.11, people are looking for comfort and love and compassion," said Guelle's granddaughter, Joni Gruelle Wannamaker, who was at the induction ceremony. "You can always cuddle a Raggedy Ann doll." It is generally agreed that London engraver and mapmaker John Spilsbury made the first jigsaw puzzle around 1760. At the time they were known as "dissections" and were maps cut into blocks to teach geography to British children. The National Toy Hall of Fame is located at the A-C Gilbert Discovery Village in Salem, Ore.
A panel of education and civic leaders vote-in two inductees each year.